anthranol, aloetic acid, anthracene, ester of cinnamic acid, aloe-emodin, emodin, chrysophanoic acid, ethereal oil as well as resistannol. Saccharides: It contains various saccharides including glycoprotein, mucopolysaccharide and polysaccharides such as galactose, xylose, arabinose, acetylated mannose as well as the remarkable acemannan. Prostaglandins and fatty acids: The conversion of fatty acids to prostaglandins are rare but the major unsaturated fatty acid, gamma-linolenic acid can be converted to 1-series prostaglandins and have a very effective influence on reducing inflammation, allergy as well as helping platelet aggregation (blood clotting at wound sites) as well as wound healing. Other constituents: It furthermore contains enzymes (oxidase, amylase, catalase, lipase and alkaline phosphatase) amino acids (lysine, threonine, valine, methionine, leucine, isoleucine and phenylalanine) vitamins (vitamin b1, B2, B6, C, E, folic acid, choline and beta carotene) minerals (calcium, sodium, manganese, magnesium, zinc, copper and chromium as well as other miscellaneous compounds such as cholesterol, triglycerides, steroids, uric acid, lignins, beta-sitosterol, gibberellin and salicylic acid. Therapeutic uses of aloe vera: Internal use: The herb is used internally to combat most digestive problems, including: constipation, poor appetite, colitis, irritable bowel syndrome as well as asthma, diabetes, immune system enhancement, peptic ulcers. Studies have also shown that when aloe is taken internally it can stimulate and regulate various components of the immune system by stopping the inflammation and blood supply of tumors. It also showed interesting results in preventing carcinogenic compounds from entering the liver and is combined in some cancer treatments. The juice of the inner leave can be used for its anti-inflammatory effect it has on Crohn's disease, but the laxative and bitter principle of aloe must NOT be used by people suffering from Crohn's disease as it causes griping and cramping. It contains aloemannan which stimulates the growth of healthy kidney cells and helps to slow the formation of kidney stones. The juice can be used very successfully to treat heartburn as well as ulcers and to sooth the lining of the digestive tract. It is not that effective to treat stress induced ulcers. However, it can be used for peptic ulcers caused by excess acid, aspirin, non-steroidal anti-inflammatory drugs as well as alcohol use. The oral use of aloe has produced good results in patients suffering from asthma when the asthma sufferers were not dependant on corticosteroids for treatment. The exude from the leaves are used as a strong purgative and stimulant laxative but can cause griping and has an abortifacient effect and should not be used in pregnancy. The bitter principle in aloe exudate which cause the laxative effect is preferable to use than that of cascara and senna, as aloe draws less fluid into the large intestine and are less likely to cause electrolyte imbalance than the other two. In a study where volunteers ate 120 grams of parboiled aloe for lunch and supper a marked decrease in cholesterol, triglycerides and sugar was found, while in another test using aloe extract, it reduced fasting bloodsugar dramatically which is probably due to the stimulating effect it has on the pancreas to produce more insulin. Watch this Video - HOW TO PREPARE A VERY DELICIOUS AND HEALTHY ALOE VERA DRINK External use: Aloe is used externally for the treatment of: skin irritation, burns, scalds, sunburn, wounds, eczema, psoriasis, acne, dermatitis, ulcers, stimulate cell regeneration The gel can be applied directly to the skin as a softening agent. 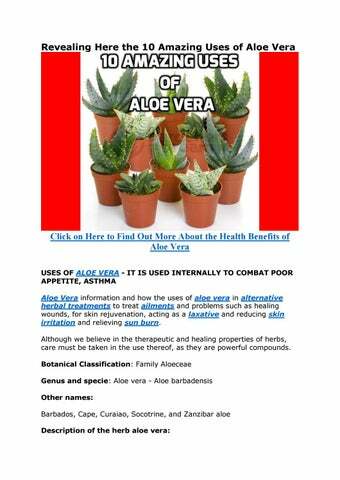 For burns and other wounds aloe is particularly effective as it activates the macrophages which fights bacterial infection while at the same time increasing circulation to the area which results in accelerated healing. The enzymes - carboxypeptidase and bradykininase are both involved to reduce swelling, itching, reducing inflammation as well as pain. Studies confirmed that wounds treated with aloe heal far faster than other wounds not so treated - both for traumatic as well as surgical wounds. This may be because it contains not only vitamin E and C as well as zinc, but the polysaccharides also reduce inflammation and stimulate the fibroblast and epidermal growth and repair process. The juice is also effective for the treatment of minor wounds and insect bites by forming a "natural plaster" over the wound. It has good astringent qualities and is usually combined with other ingredients, to make an excellent, soothing treatments for the skin and can also be used with great success on hemorrhoids (piles). In studies it also showed a marked result in producing remission in skin cancers and its superb anti-oxidant effect is effective to help prevent skin damage from x-rays and other forms of radiation. When applied regularly to psoriasis great results are achieved and relieve the pain and inflammation of eczema. When people with frostbite was treated with a cream containing aloe, the incidence of tissue loss and amputation was reduced. Aloe-emodin which is one of the ingredients not only has a laxative effect, but it is also involved in killing the herpes virus which causes cold sores and shingles. Aromatherapy and essential oil use: Aromatherapists use aloe vera by infusing the plant material into a base oil, such as almond or apricot kernel oil. This macerated oil exhibits astringent, emollient, anti-fungal, antibacterial, and antiviral properties. The oil is combined in massage therapy for its healing and rejuvenating properties. Safety precautions and warnings: Pregnant and breast-feeding women should not use aloe latex (the laxative part) internally, although the topical application of aloe to the skin has no effect on pregnant or breastfeeding women.